I’m writing this piece during the last few days of September and summer seems to be holding its breath not wanting to leave the stage for the entrance of autumn. Which is making me having to guess again when to settle in our winter crops, writes Paul Richens. Timing in gardening, as in most things, is crucial. Sowing too early or too late can be disastrous – well, at most, unfortunate I suppose! Last year I sowed some green manures too early in the rather warm autumn to see them grow large and then get taken by the first frost. During our last Lunch & Learning session we sowed some Garden Wine Cap mushroom spores in a couple of our planters and top-dressed them deeply with our lovely humus, straight from the Ridan composter unit thinking that we’d get a nice harvest two weeks later but no chance – it’s still warm enough for the fungus to keep on feeding and not make any mushrooms. You can almost hear the mycelium munching! 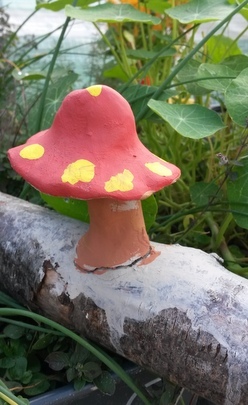 Luckily our young students had plenty to do painting their (now dry) clay mushrooms that will soon grace the skips. It’s no different with this year’s winter crop of leaf. 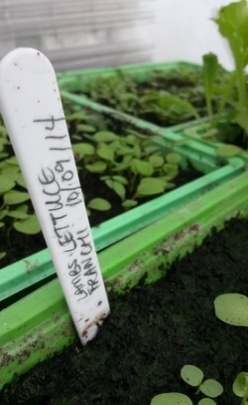 Our wonderful ‘Twilighters’ sowed 15 trays of winter lettuce and leaf on the 10th September; these have shot away (with gusto) so was that too early or just right – as with most gardening things only time will tell. Anyone for pricking out and potting on?